The US is planning to move the majority of its warships to the Asia-Pacific region by 2020, Defence Secretary Leon Panetta has revealed. He said that by 2020 about 60% of the US fleet would be deployed there, in the clearest indication yet of the new US strategy in Asia. 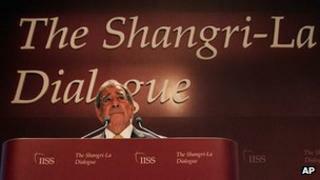 Mr Panetta told a regional security meeting in Singapore that the shift was not aiming to contain Chinese power. Beijing has indicated it is unhappy with the US boosting its presence. Last November, President Barack Obama announced that the Asia-Pacific region was a "top priority" of US security policy. His comments were seen as a challenge to China, which is striving to be the main regional power. "By 2020, the navy will reposture its forces from today's roughly 50-50% split between the Pacific and the Atlantic to about a 60-40 split between those oceans," Mr Panetta told the annual Shangri-La Dialogue conference. The US defence secretary is on a mission both to explain and reassure. Firstly to set out in more detail the practical implications of Washington's strategic re-balancing towards Asia and secondly to reassure America's allies in the region who wonder if it can really afford to fund this new strategy given the budgetary pressures at home. Mr Panetta also sought to play down any suggestion that Washington's new strategy was aimed at China. He stressed the need for closer military ties between China and the US - especially for understanding in the difficult areas of cybersecurity and outer space. However his support for a comprehensive new "rules-based" system to resolve competing territorial claims in the South China Sea will not go down well in Beijing. "That will include six aircraft carriers in this region, a majority of our cruisers, destroyers, combat ships and submarines." Mr Panetta said the US would aim to increase the number and size of the training exercises it conducts alongside its allies in the region. He said US budget problems and cut-backs would not stop the changes, adding that the US defence department had money in a five-year budget plan to achieve its goals. "It will take years for these concepts, and many of the investments we are making, to be fully realised," he said. "But make no mistake, in a steady, deliberate and sustainable way, the United States military is rebalancing and brings enhanced capabilities to this vital region." China has long-running territorial disputes with allies of the US, including the Philippines, over island groupings in the South China Sea. In recent years it has grown more assertive on the issue. An increased US presence in the region is likely to embolden those countries and irritate Beijing. Mr Panetta played down any possible tensions and said he was looking forward to visiting China later this year. "Some view the increased emphasis by the United States on the Asia-Pacific region as some kind of challenge to China," he said. "I reject that view entirely. Our effort to renew and intensify our involvement in Asia is fully compatible with the development and growth of China. Indeed, increased US involvement in this region will benefit China as it advances our shared security and prosperity for the future." In January, Chinese state media also said an increased US presence in the region could boost stability and prosperity. But it warned the US against "flexing its muscles" and said any US militarism could create ill will and "endanger peace". Mr Panetta is currently on a nine-day tour of Asia which will include visits to Vietnam and India.